Sunday April 16th 1922 Hattie to church. I was down to Otts awhile. The folks rode in afternoon. Rob worked in evening. We all read till early bedtime. 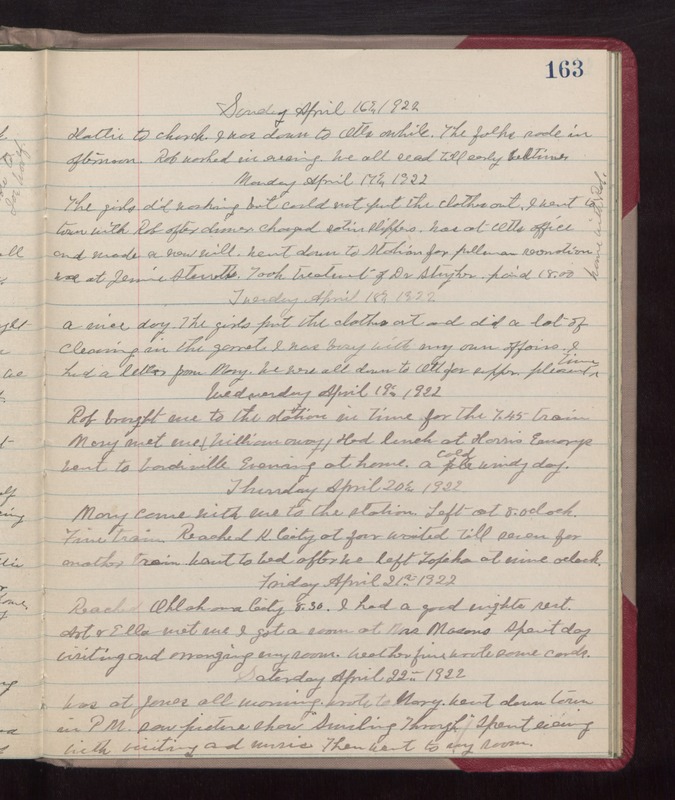 Monday April 17th 1922 The girls did washing but could not put the clothes out. I went to town with Rob after dinner. [Charged?] satin slippers. Was at Otts office and made new will. Went down to Station for pullman reservation. Was a Jennie Sterretts. Took treatment of Dr Stryker. paid $18.00 Home with Rob. Tuesday April 18th 1922 A nice day. The girls put the clothes out and did a lot of cleaning in the garret. I was busy with my own affairs. I had a letter from Mary. We were all down to Ott for supper. pleasant time. Wednesday April 19th 1922 Rob brought me to the station in time for the 7.45 train. Mary met me (William away). Had lunch at Harris Emorys. Went to vaudeville. Evening at home. A cold windy day. Thursday April 20th 1922 Mary came with me to the station. Left at 8. oclock. Fine train. Reached K. City at four. waited till seven for another train. Went to bed after we left Topeka at nine oclock. Friday April 21st 1922 Reached Oklahoma City 8.30. I had a good nights rest. Art & Ella met me. I got a room at Mrs Masons. Spent day visiting and arranging my room. Weather fine wrote some cards. Saturday April 22nd 1922 Was at Janes all morning. wrote to Mary. Went downtown in PM. Saw picture show "Smiling Through." Spent evening with visiting and music. Then went to my room.